We are one of the eminent traders, importers, suppliers, distributors and wholesalers of a broad range of Plastic Mirror Sheets. These products are manufactured using superior grade raw material and latest technology at vendor's premises. We offer these products in several specifications to our clients, who are spread across the country. 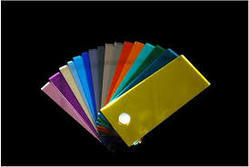 Our product range includes Plastic Mirror Sheets, Acrylic Mirror Sheet and many more. These products are appreciated for their features like their eco-friendliness, lightweight, easy installation, durability, corrosion resistance, perfect finish and dimensional accuracy.